We at Carlow County Development Partnership are always excited to meet with communities and groups who are working to bring about positive change in their areas. So we are delighted to be associated with the Community Garden at Gleann na Bearu in Bagenalstown. 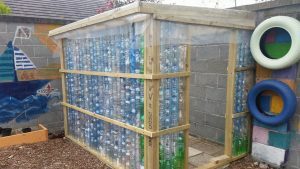 Over the past few months this group has been meeting on Wednesday mornings, working hard, planting seeds and creating a unique greenhouse made out of recycled plastic bottles. Community Gardens like this one are all about being together, and can have very positive social, economic wellbeing and environmental impacts on communities. Participants connected with the gardens normally have a better appreciation of their community and get great satisfaction from the work done outdoors. Carlow County Development Partnership are working in a number of horticulture projects like this, as well as with the Gairdin Beo in Carlow town. Clonegal in County Carlow has earned itself the reputation as one of the prettiest towns in Ireland following their success in prestigious awards such as The Tidy Towns competition and the Entente Florale Europe. The reputation is well-deserved and a credit to the people behind the Tidy Towns committee and also to the Tús participants who over the years have been instrumental in the physical task of keeping Clonegal beautifully landscaped and litter-free. Marie Byrne, secretary of the Tidy Towns committee is passionate about Clonegal despite describing herself as a ‘Dublin blow-in to the village’. She, along with her fellow committee members appreciate the beauty, history and unique aspect of Clonegal and play a significant role in the community effort made by the people of the village in their bid to make Clonegal the Tidiest Village in Ireland. ‘We are very proud of Clonegal and what we have achieved for our village. Everyone takes a personal interest in ensuring that the village is well kept and we also have great support from the Tús workers over the years. Their input was invaluable when we represented Ireland in the Entente Florale in 2013 and won the Gold Medal. We have a small workforce and therefore the availability of a Tús worker to us made a big impact. They are so willing and so helpful’, says Marie. In order to prepare Clonegal for that competition, there was considerable planning and physical work undertaken by the committee. In 2014, with the support of Tús participants, they developed a new community garden for the use of the people of Clonegal and visitors to the village as they come to the end of the ‘Wicklow Way’ walk. "We walk the town and make a list of what needs to be done at the beginning of the year and then we speak with the Tús supervisor who in turn prepares a work schedule for each Tús worker. We know that if we ask them to do a job it will be done. They are so reliable and dedicated. We would be lost without the help of the Tús workers” Marie says. In 2015, the ‘Weavers Cottage’ was supported by Tús with a participant on site to keep the cottage open for visitors. The Tidy Towns committee of Clonegal depends on the additional support of Tús as it takes pressure off the committee and regular volunteers who are always in demand. In that year, Clonegal was named Ireland’s tidiest village in the national Tidy Towns awards for the second year running. and in 2016 it was awarded a Gold Medal in the same competition. 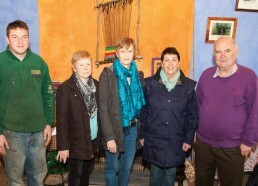 ‘The Tús workers offer invaluable support to the Tidy Towns committee. We are a small village so it is the same people doing the same work all of the time. The Tús workers relieve some of the pressure and not only that, they do a fantastic job – they know what they are doing. We are always there for them too – I think it is a mutually beneficial relationship!’ says Marie. There is currently one Tús participant supporting the work of the community as they come together to make their village one of the nicest places to live in Carlow. The LEADER programme has also supported Clonegal over the years, including in the upgrade of a rural walk, developing a DVD to market the town and publication of a tourism brochure. Carlow County Development Partnership is delighted to have supported the work of this community in numerous ways over the years. They are an example of what can be done when people come together to make their part of the world better in little ways, day by day. Everyone has something to give. It doesn’t matter what our age, our skills, or our passions are....we can join together to make Carlow a great place to live. 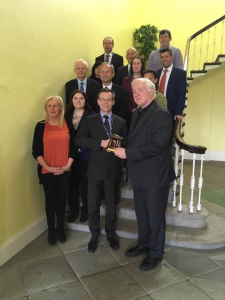 Carlow County Development Partnership's SICAP Programme Education Officer Dylan Thomas recently took part in a meeting on the educational challenges facing members of the Latvian community. The Latvian Ambassador, Gintz Apals and an international delegation from Latvia took part in the round table event which was held in Carlow College. The event was a great success with considerable exchange of information and learning. 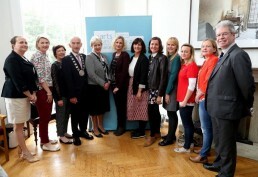 Senator Jennifer Murnane O'Connor and Mayor Fintan Phelan also participated. The group were warmly welcomed by Fr. Conn O Maoldhomhnaigh, President of Carlow College who also presented the Ambassador with a plaque of the Carlow Dolmen. The challenges associated with moving to a new country can create stress for families and difficulties with the new language can mean that parents struggle to support their children as they progress through school. Carlow County Development Partnership are deeply committed to supporting the full development of individuals and communities in our region and this includes memebers of new communities who have moved into the county in recent years. An important part of SICAP work is supporting local groups to leverage funding and link into regional or national structures or programmes. An example of this is Take A Part, which is a social and community arts programme in the Tullow Road area of Carlow, an exciting collaboration project between Carlow County Development Partnership, Carlow Arts Office, Carlow County Council, Carlow Regional Youth Services and local residents. Funding came from The Arts Council of Ireland under their Invitation to Collaborate. Carlow was one of just 6 local authorities to secure funding. The aim of the project is to break down barriers of what art is and how it can act as a tool to transform local communities, creating opportunities for social exchanges, participation, access and involvement in decisions relating to the local area. The project is managed by the Arts Action Group, made up of agencies and representatives from the Tullow Rd area who wish to engage in this programme. A co-ordinator has been employed to support the Arts Action Group in delivering on the projects. Carlow County Development Partnership was pleased to play a vital role in the Take a Part Carlow initiative. The Tullow Rd is one of CCDP’s key areas for development with large investments of resources in supporting the capacity development of groups and individuals in the area. We recently initiated the development of the Tullow Rd Development Group, who we continue to support. We are working with The Sports Partnership in developing a Sports Hub for the area and are building the capacity of a number of residents’ associations. Because of this intense community development approach, as well as the work of other agencies in the area such as Carlow Regional Youth Services and Barnardo’s, it has allowed this exciting Art Project to concentrate in the area of the Tullow Rd. CCDP sit on the Arts Action Group and we have identified a number of local residents to do the same. 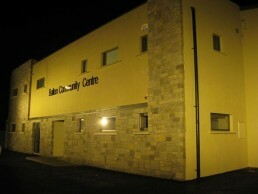 Ballon Community Centre is a thriving hub of activities most days of the week. It boasts a spacious, modern hall complete with attractive wooden floor, which at 500 square meters, is licensed for occupancy by up to 500 people. 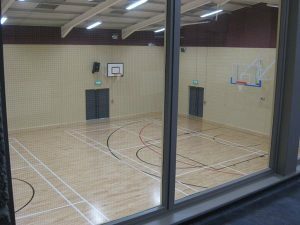 Sports activities that are held there include athletics, badminton, basketball, bowls, fitness classes, GAA, martial arts and soccer. The venue is perfect also for parties, dances, fairs, shows, concerts, public entertainment, conferences and much much more. Full use of the main hall, viewing area, kitchen, tables, chairs, multi media facilities and hi-tech sound system is available. . The Centre was originally built in 1976 thanks to the voluntary work and the fundraising efforts undertaken by members of the community at that time. Since then the Centre has been a focal point of community activity and has been host to an endless number of social, family and sporting gatherings. A complete redevelopment of the Centre was undertaken in 2013 resulting in the superb facility that exists today. The redevelopment project was made possible again thanks to years of planning, fundraising and voluntary work undertaken by members of the community. Carlow County Development Partnership is always delighted to support the energy within communities and individuals to bring about positive change in their areas and provided mentoring to the group to submit an application for funding to the LEADER Programme which resulted in substantial financial support being received under the Rural Development Programme. 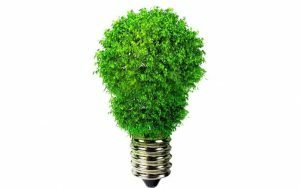 ‘Our experience shows that people and groups are interested in green energy but are often confused by the range of technologies and whether the advice is objective or a sales pitch. What we in Carlow County Development Partnership CLG particularly like about this Sustainable Energy Community Network initiative is the expert advice is objective and is publicly funded and therefore, we are encouraging individuals, enterprises, organisations and community groups in Carlow to participate in this initiative and at the very least, get an energy assessment carried out on their buildings and facilities by an objective expert free of charge'. ‘at the point then of having the energy assessment carried out, people and groups are in a very strong position to make a fully informed decision on what is the best green energy options for their particular set of circumstances"
"From a Tullow community point of view, we have worked with the Carlow/Kilkenny sustainable energy group in the past and our project was very successful. As a result of this workshop, we are now considering taking the next step"
Check out the link on the front of the website for further details or contact Marina de Costa in the Bagenalstown office. The Failte Isteach Programme welcomes migrants into the county through conversational English classes in an informal, welcoming setting. It meets three times a week in Carlow Town and Tullow and could not function without the dedication of a team of fabulous volunteers who give of their time to run the classes. 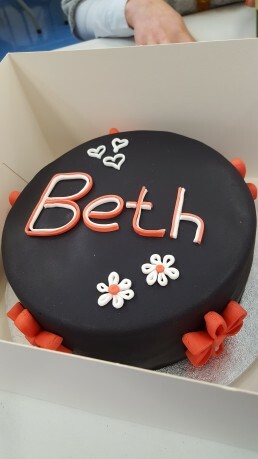 The efforts of these volunteers are hugely appreciated by Carlow County Development Partnership but also by the students, as can be seen by this beautiful cake which was presented by a student to one of the volunteer tutors last week. The Programme is run in the New Oak Community Center on Monday evenings 6 to 8 and on Friday mornings 10 - 12. In Tullow it runs in the Forward Steps Family Resource Center on Thursday evenings from 6 to 8. It takes a little break this week for Easter but feel free to drop in when it resumes. The lack of a language is one of the greatest barriers to full inclusion and participation in society, which is one of the goals of the SICAP programme. For further details get in touch through the contact page. Over the next few months an Information Roadshow will travel around the different towns and villages of the county, giving details of a number of agencies and services which are available. Carlow County Development Partnership are delighted to be involved again year, along with the PPN, Citizens Information Services, the Volunteer Center, MABS, Adult Guidance Services, Carlow Library Services, the Gardai and the Ring a Link Bus service. The first outing took place on Friday April 5th in the Borris Farmers Market in the Town Hall in Borris. In a rural county like Carlow there is a need to move services out from the main towns to rural areas and villages in order to ensure that citizens are fully informed as to their rights and the services available to them. The next event will be held in Ballinkillen Community Hall on Sunday 23rd April from 11 - 1. Ireland’s population has become increasingly diverse over the past two decades, and this is evident in all the towns and villages in County Carlow. 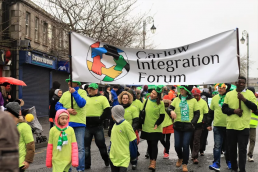 Carlow County Development Partnership CLG is committed to the development of a county in which migrants and those of migrant origin play active roles in communities, workplaces and politics, underpinned by a respect for, and celebration of, diversity. Also we are working to mobilize local communities to promote integration. One way in which this is support is through the assistance and mentoring given to the Carlow Integration Forum. 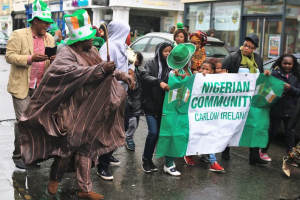 Therefore It was great to see them – and some of the individual communities which are part of it – so strongly represented at the St Patrick’s Day parade in Carlow Town. The diversity of different nations which have made Carlow their home is rightly now represented on this day which celebrates an increasing diverse understanding of national identity. 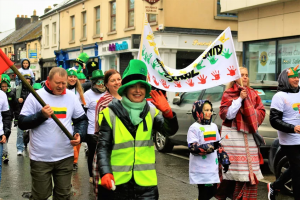 Carlow County Development Partnership SICAP Programme supports the Lithuanian Community School and also runs the Failte Isteach Language and integration programme in Carlow town and in Tullow. In recent weeks Carlow County Development Partnership has been exploring potential uses of the Upper Lock House in Tinnahinch. A successful meeting was held on Tuesday the 21th February in the boat house rowing club in Graiguenamanagh. The meeting was advertised locally with flyers in local shops and centres, in parish newsletters, by email, phone and by word of mouth, and this meant that there was a good turnout from local residents, local businesses and interested parties. The Lock House, which is right beside the River Barrow, has a ruin of a castle behind it. It was used for residential purposes up until to now, but since it has not been used in a few years, and has fallen into some disrepair, with mould and damp. Waterways Ireland owns the building and would like to see it back in use. CCDP CEO Mary Walsh chaired the meeting, and gave a presentation on the topic. Rosanna Nolan from Waterways Ireland gave in depth outline of the building, using slides to illustrate how the building looked like in the past and today. The vision for the Lock House is for a community group to use it for activity that would benefit and enhance the area. There could be funding from the LEADER programme to develop the building and site. The building could also be used by other local businesses if they had a demand for a product or service that would again benefit the community and area. If your community has an idea for the development of a derelict building or community facility please get in touch. We can assist by working with the local community and exploring potential funding from the LEADER programme.